Uncle Dixer will NOT be answering any more questions about Feng Shui fish numbers. He published a guide about Feng Shui Fish Aquarium for Abundance, and you can get your answer about fish numbers using that guide. Click here to go to the guide. (1) Dear Uncle Dixer: I was born in 1979. How many fishes can I keep? Also, what if the number of fish is different for my husband and son as we live together? Answer: Since keeping the fish is for everyone, it is better to have an auspicious number of fish for the whole family instead of basing it on your own birthday. I would suggest one black and six goldfish as the best number. If you have a big fish tank then 9 goldfish is also good. But even with a small aquarium, it is still better to have three than just one or two goldfish. You can also have 8 but since you have two men in the house it is better to have a Yang number (i.e. 9) than a yin number (i.e. 8). (2) Dear Uncle Dixer: We are a family of two with me and my wife. I am born in 1988 and my spouse in 1990. How many fishes should I keep? I currently have two Parrot fish and 5 Oscars. Thanks in advance! Answer: If you can add one more Parrot fish that would be perfect. Both 3 and 5 are Yang numbers and that is auspicious. Also, the total number of 8 is also a lucky number. Do remember to retain the same number with replacement if one of them, in either group, happen to die in the future. (3) Dear Uncle Dixer: We are a family of two with me and my wife. I am born in 1985 and my spouse in 1984. How many fishes should we keep? Answer: Since your Ming Kua, or Trigrams of Fate, is 6 Metal and your wife is 8 Earth, you can have 8 fish with 6 being gold fishes with some white trimming and the other two with a different color. That would be a harmonious Five Phase combination for you and your wife. (4) Dear Uncle Dixer: My cousin has a family of five, consisting of him, his wife, son, father, and mother. His was born in 1987, spouse 1989, son 2013, father 1963, and mother 1966. How many fishes should he keep? Currently, he has 5 Parrot fish, 2 Oscar fish, 1 yellow Shivram, and 1 Green Terror. The second fish tank has 2 Flower Horn fish. Please advise. Thanks in advance. Answer: Having a pair of the same kind is considered auspicious. However, 5 is a controlling number, so I would have a combination of 2, 3 and 4 in one tank and the other tank with a pair of Flower Horn is fine. That would fit in with the East Four and the West Four grouping of people living in the same house as well, since 3 and 4 belongs to the East Four and 2 belongs to the West Four group. (5) Dear Uncle Dixer: I am born in 1981 and I have 3 family members with my mom, me, and my daughter. How many number of fishes can I have and where can I place the fish tank? Answer: Since your Ming Gua (Trigram of Fate) number is 1 Water and you are living with two females, you should have one black gold fish and 4 colored ones to make a total of 5. Your fish tank should be located to the North of the room,. where you intended to locate the aquarium. (6) Dear Uncle Dixer: I recently bought a small plastic barrel , which serves as my aquarium right outside the front door. I have 2 gold fishes in it. I can accommodate a few more, but not 9. We are a family of 5. My husband was born in 1978, me 1985, kids 2007, 2009 and 2017. Is it OK to have 2 fishes? If yes, how many more should I buy? Thank you so much in advance! Answer: 3 or 5 is better because they are both Yang numbers (the odd numbers are considered Yang and the even numbers Yin in Feng Shui). You can have 1 black and 2 gold, or 2 black and 3 gold to be considered auspicious. (7) Dear Uncle Dixer: Which position should I place the fish bowl? How many fishes should I put in the bowl for good luck and wealth? Answer: Place the fish bowl towards an open space with a solid wall behind. This way, you can appreciate its beauty when you enter into the room. 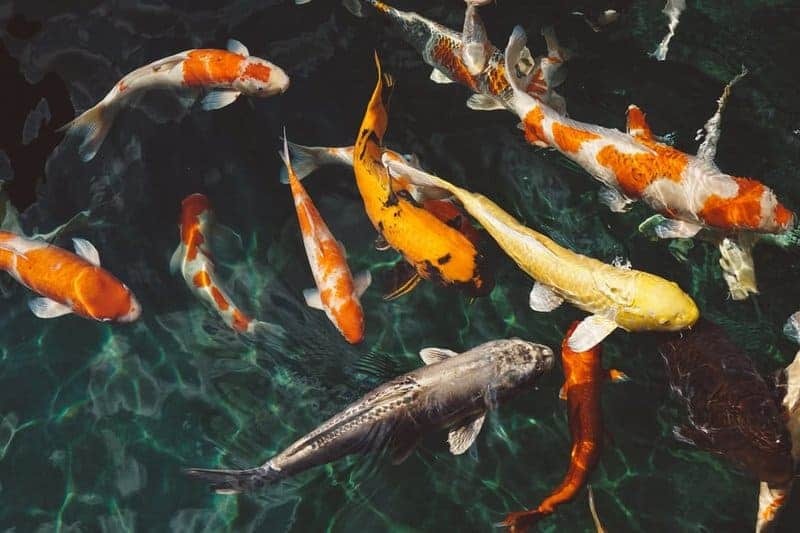 Generally speaking, Chinese prefer an odd Yang number over a Yin even number, so you can have 3, 5, 7 or 9 gold fish with one of them being a black one. Then you will always have one Yang and one Yin number of fish to make up a total with a Yang number. (8) Dear Uncle Dixer: I was born in 1975. Can you please let me know how many fishes I can keep and which fish species? Thank you. Answer: From a Feng Shui perspective, gold fish are the best. You can have one black with 2 or 4 or 6 or 8 gold ones, depending on the size of your aquarium. That would make a Yin/Yang combination both in number and in color, which is considered auspicious. (9) Dear Uncle Dixer: I was born in 1957 and my house has 5 people. How many fish could me put in my aquarium? Answer: You are a West Four person, so you can have 6 to 9 fishes, depending on the size of the tank. (10) Dear Uncle Dixer: My DOB is 1985 and my wife’s is 1992. I have 4 gold fishes, 1 black moor, 2 gappy. Please suggest a good number of fishes. Thank you! Answer: You have a total of 7 fish but 8 is considered more auspicious. You can add one more Gappy so the combination is 4:1 and 3:1, with the black moor as the link for the two pairs of Water (1) generated Wood (3 and 4) combinations. In Feng Shui numerology, this is associated with growth and vitality. (11) Dear Uncle Dixer: In my house there is one husband, one wife, one son, and one daughter. How many fishes can I keep? Answer: Congratulations! The Chinese character for “good” is made of one son and one daughter. You are already very fortunate. Why not double your luck and have 8 fishes, two for each person in the house? (12) Dear Uncle Dixer: We are a family of 5. My husband was born in 1970, me in 1973, elder daughter 2000, second daughter 2005, and younger son 2008. We have a small fish tank with 2 gold fish and 1 black fish kept on the Southeast side of the living room. Is this fine as per Feng Shui? Or shall I add 2 more gold fishes? Can’t add anymore. Please advice. Answer: You have 3 females and 1 male in the household and half of them (you and your younger daughter) is East Four and the other half West Four. I assume your husband is the bread-winner, so he can do with a little bit of extra support. I would suggest the number of fish should be an odd or Yang number. You have 3 fishes at the moment so that is fine. If you want more, then you can have 3 gold and 1 black to keep the total number being Yang. The South-East is an East Four, so that suits you and half of the household. Now, the auspiciousness of number and direction is shared between the two halves of the family and that is desirable in Feng Shui. (13) Dear Uncle Dixer: I want to place an arowana fish in my home but only one. Should I get 8 more fishes for good luck and wealth? Answer: Yes, one plus eight equals nine, the maximum Yang number for luck. (14) Dear Uncle Dixer: My husband was born in 1987, myself in 1992, and my son in 2013. How many fish can be kept at home? And what kind of fish? Answer: If your fish tank is large enough, 1 black and 8 gold fish would be an auspicious number to have. If you have a smaller tank, then 1 black and 4 gold fish would also be good to have. (15) Dear Uncle Dixer: I was born in 1979 and have a family of 2 kids and a wife. Currently I have 2 parrot fishes. Please let me know how many fishes should I keep in my aquarium. Thanks! Answer: You should have an odd number of fish in your aquarium because an odd number is considered a yang number and is more desirable from a Feng Shui perspective. I would introduce an extra fish in you tank – a bottom feeder fish that can live well with parrots, like a Pleco fish, a catfish, or a loach. The color of the additional fishes should contrast with the color of the existing two fish, so there is a Yin Yang difference as well. (16) Dear Uncle Dixer: I have 8 different fishes in my aquarium at my showroom, which is my main office. I do not have any gold fishes. Does this affect Feng Shui Luck? I have 2 Parrots, 2 Silver Sharks, 1 Angel, 2 Red Albinos, 1 Rainbow Shark. Also, my aquarium is placed right next to the main door of the showroom, which is in the East part of my building. I was born in 1983 and its a year that I have just started my business. Any suggestions for better luck and progress? Thanks! Answer: You don’t need gold fish. The fish of different kinds are there to stir the water representing wealth. But it would be more auspicious if you can have a combination of 3 and 2 instead of 1 and 2 because 3, 2 (pronounced “sheng yi”) has the same sound as “business” in Chinese. Thus, it supports the correlative idea that the right combination of fish will activate the potential for wealth in your business. Angel fish with mostly yellow color would represent the Phase of Earth in color. Silver Shark can represent Metal, and Parrots with lots of blue would represent Water. In the Five Phase relationship, Earth can generate Metal and Metal generates Water (Wealth again). This would be the best combination. Therefore, I would suggest that you have 2 Angels, 3 Silver sharks, and 3 Parrots making a total of 8, which is also an auspicious number, considering that your Ming Kua (Trigram of Fate) number is also 8, calculated from you year of birth. The location is fine but please make sure that the fish tank is not facing directly outward at the front door. This will help prevent the symbolic wealth for your business from flowing out of the door. It sounds like it is placed to one side to the entrance (the East, the rising Yang side), so that is fine. I hope this will bring better luck and progress for your business.